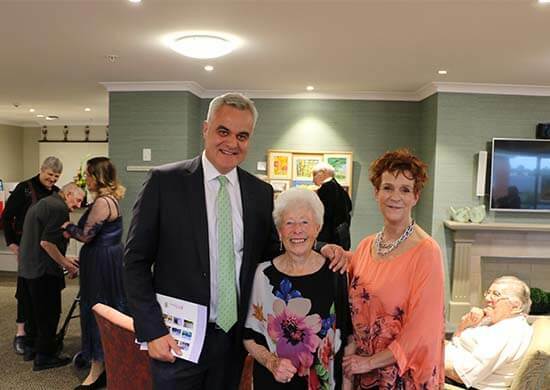 That painting is good for the soul has been proven over and over at Essie Summers village, which in mid-November hosted a Special Care Art Exhibition for the third year running. Residents, families and special guests had a fabulous opening night. The exhibition reflected the passion and organisation skills of art teacher Margaret Doerner and staff at the village. Margaret, alongside Activities Coordinator Lavinia Quinn, runs weekly classes for those at the care unit, many of whom have dementia. Margaret's husband was a resident, and she started the classes as therapy for him, and she hasn't stopped since. The show was a delight for the families. More than 50 attended the first night, including Gordon MacLeod, New Zealand Operations Manager Liz Dilger and Village Manager Rosemary Deane. Margaret trained as a teacher and has taught art for much of her life but says the last few years of tutoring have provided the most surprises. Some special care residents have never painted in their adult lives, but their natural talent on art paper soon appears during lessons, Margaret, a Christchurch octogenarian, says. Last year’s set of paintings were eventually exhibited at the Christchurch South Public Library. This year the fabulous marketing team has made the art into a 2019 calendar which is being sold to raise funds for the Stroke Foundation. Relatives and others have been able to get a calendar from the village. Margaret’s husband, Graeme, who passed away in 2016, was a dementia resident at Essie Summers. During his life he had been a Royal Doulton designer, a sculptor and painter, and so art sessions for him and other village residents seemed to fit, she said. Gordon MacLeod with artist Margaret Doerner and Essie Summers Village Manager Rosemary Deane.